Right in the middle of summer, it starts to happen–you see that first ad for notebooks and backpacks. Another week or so goes by and suddenly you realize that every other ad during the commercial break is for laptops, dorm essentials and new clothes. Back to School season has returned. 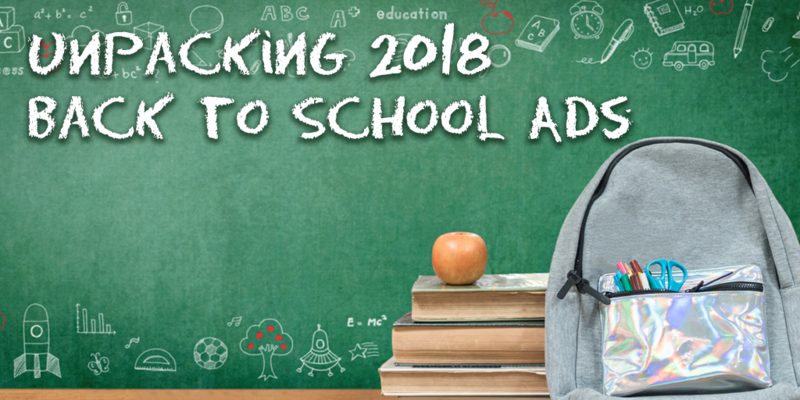 This year, we decided to highlight the Back to School ads of 2018 that really stood out. Target grabbed our attention by making multiple references to pop culture and internet memes. Advertising targeted at Generation Z just wouldn’t be complete without Minecraft, unicorns, and the famous “floss dance.” The commercial also features a catchy song called “TREAT MYSELF” from pop princess Meghan Trainor. This trendy spot gathered about 479,176,058 TV impressions from 7/21-8/31 and saw its highest attention score (91.76) on FOX. Macy’s chose a different route, using a song by lesser-known electropop band NVDES. Unlike most back to school ads that show children grabbing school supplies, this spot features some pretty amazing young athletes. Some standouts include the young karate girl chopping a board with her bare hands, and the teenage gymnast fiercely holding a split across an aisle of the auditorium. Macy’s focused on the early Back to School season, airing this spot from 7/30 – 8/20 and grabbed approximately 506,042,963 TV impressions. Macy’s saw attention scores over 95 across several broadcast networks, including USA Network and Bravo. While it’s likely that the children cast in this commercial weren’t alive back when the 2003 hit “Let’s Get It Started” was released, it creates a great theme song as fathers head to Walmart to pick up backpacks for the school year. An emotional final scene shows parents surprising their children with a pep rally as they enter their first day of middle school. Walmart hasn’t slowed down on this spot, as Back to School season in the U.S. includes practically all of August and September. For the airing range so far, (7/15-9/4) this spot received approximately 2,568,419,646 TV impressions and had attention scores over 85 on networks like Discovery Channel and Nickelodeon. Old Navy played up the cuteness factor with a Back to School ad starring children dancing in a silent disco throughout a library. The clothing brand also chose and early 2000’s classic, “Move Your Feet” by Junior Senior as the theme for this ad. Some of you may have noticed one familiar dancer, Reese Hatala (sister of Taylor Hatala, competitor on NBC’s “World of Dance”). Reese and her sister have been featured on “The Ellen Degeneres Show,” and both have loyal Instagram followings as they’ve quickly risen to fame in the Los Angeles dancing world. While Old Navy saw the best attention scores on networks like E! and HGTV, this spot grabbed a total of 584,797,213 TV impressions during 7/31-8/26. Wrapping up our list, Amazon goes for a humorous angle while keeping true to their brand. A search bar quickly fills up with specific and quirky school supplies one might search for, like “dinosaur folders” and “piano binder.” But who would have thought to search for a back to school item as unique as a laser cat t-shirt? During the full airing range (7/29-8/19) of this spot, Amazon gathered 341,044,074 TV impressions. The highest attention score for the laser cat spot came from the NFL Network, with a score of 96.35. What is your favorite Back to School ad that you saw this year? Let is know using #iSpotBTS on Twitter, and don’t forget to tag @ispottv !